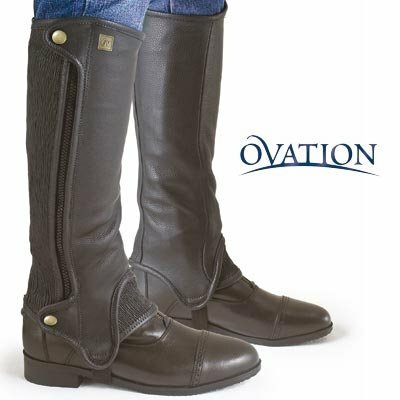 Ovation Precision Fit Half Chaps come in a variety of sizing combinations for a perfect fit. Premium top grain leather with stretch leather panel provides a custom-like fit. Stretch leather skirt over the instep provides more coverage over your boots. Snap tabs at top and bottom of the dirt-resistant YKK zipper keep the zipper locked and in-place. Ovation is your go-to brand for all things English riding and Dressage. From genuine leather and suede to durable metal hardware, Ovation delivers high-quality apparel and accessories for today's classic rider. If you have any questions about this product by Ovation, contact us by completing and submitting the form below. If you are looking for a specif part number, please include it with your message.